ACHACHILA: Grandfather. The Aymara spirit that protects the people. "¿A CÓMO ES? ": Expression used to ask how much something costs. AFRO BOLIVIANO: Descendent of African slaves. The Afro-Bolivian communities are found primarily in the Yungas. ALPACA: Andean camelids that have the finest, warmest wool. ALPACA (2): zinc, copper and nickel alloy. 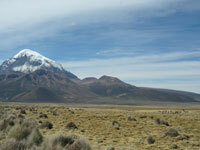 ALTIPLANO: Andean plain located at 4000 meters above sea level (MASL). 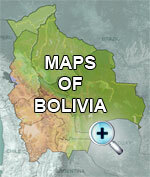 ALTO PERÚ: Name that was used during the colonial period (until 1825) for what is now Bolivia. 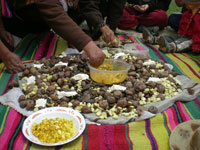 AMBROSÍA: Drink from southern Bolivia which is a mixture of fresh milk and singani (grape brandy). APACHETA: Stone altar for offerings to the pachamama and achachila. The person approaching the apacheta should pick up a stone, rub it on a part of the body to transfer his/her weariness to it and recover his/her energy. AUDIENCIA DE CHARCAS: The highest court of the Spanish Crown in Alto Peru during the 16th century. AIMARA: (Aymara) 1. Pre-colonial Andean people; 2. Pre-colonial Andean language. BALSA: 1. boat 2. wood 3. Tree that produces the wood used for small boats.